Death and Extinction of the Bees. The Role of Monsanto? This article was originally published in March 2014. 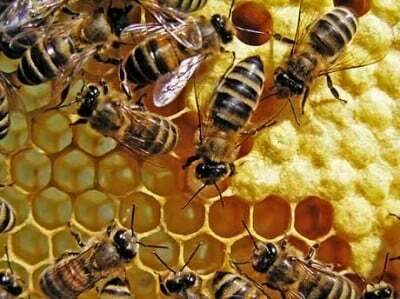 What has been the role of Monsanto in the loss of of the global honeybee population. It is only recently that this issue has been the object of mainstream media coverage. Since 2006 beekeepers have been noticing their honeybee populations have been dying off at increasingly rapid rates. Subsequently researchers have been scrambling to come up with an accurate explanation and an effective strategy to save the bees and in turn save us homo sapiens from extinction. Recent harsh winters that stay freezing cold well into spring have been instrumental in decimating the honeybee population in Iowa by up to 70% as well as the other historically high yielding honey states – the Dakotas, Montana, Minnesota. The northern Plains and Midwestern states that have regionally always produced the nation’s most honey have been severely hurt by the long harsh winters in the last couple years. Florida as the third largest honey producer and especially California always among the top producers have been hit especially hard by decreasing bee colony populations. In 2006 when the problem of bee loss first was noticed, California was right up at the top with North Dakota producing nearly twice as much honey as the next state South Dakota but its bee numbers have incurred such heavy losses that in 2011, though still second, California’s honey production fell by nearly half in just six years. The recent severe drought in California has become an additional factor driving both its honey yield and bee numbers down as less rain means less flowers available to pollinate. Honeybee Colony Collapse Disorder (CCD) as this loss of bee phenomenon has been called is currently recognized as such an urgent crisis that a month ago Newsweek ran an article outlining the U.S. Department of Agriculture (USDA) announcement that it will provide a $3 million subsidy in order to help the one animal on the planet that will either make or break food prices. According to the latest USDA industry survey, this emergency plan assistance comes after nearly a third of commercial honeybees died last winter, a whopping increase of 42% from the previous year. The three million dollar giveaway program is designed to entice both Midwest dairy farmers and cattle ranchers to reseed their fields this spring with eco-friendly crops like alfalfa and clover to develop healthier habitats for increasing the national bee population. Farmers and ranchers only had until March 21st, 2014 to sign up and take advantage as eligible seedling recipients. Last month’s Newsweek reported that honeybees in trucks migrate to various regions of the country to pollinate an estimated $40 billion worth of the nation’s agricultural produce each year. This means that every third bite of food we eat comes as the result of bees and other pollinators. USDA Agriculture Secretary Tom Vilsack stated that more than 130 fruits and vegetables that make up a nutritious diet are cross pollinated by honeybees. Commercial bees raised on farms and then shipped to other farms in the country used for pollination purposes along with wild bees are responsible for pollination of an estimated 80% of all food crops in the United States. In the last half decade alone 30% of the national bee population has disappeared and nearly a third of all bee colonies in the U.S. have perished. Though the rate of bee depopulation is growing each year, 42% more last year than the year before, even at the current annual rate the estimated monetary loss is a colossal 30 billion dollars a year. With such an enormous loss in revenue, last month’s USDA announcement of just a three million dollar investment in farmer aid in comparison to the formidable challenge seems like a paltry drop in the bucket to making any real dent in the epidemic. With so much at stake, efforts to investigate and uncover reasons for this sudden global pandemic have been robust. A new government study blames a combination of factors for the mysterious and dramatic loss of honeybees, including increased use of pesticides especially in the US, shrinking habitats, multiple viruses, poor nutrition and genetics, and even cell phone towers. However, according to last year’s joint EPA-USDA study, the biggest cause is the parasite called the Varroa destructor, a type of mite found to be highly resistant to the insecticides that US beekeepers have used in attempts to control the mites from inside the beehives. Moreover, new virus species have been found in the US and several of these have been associated with Colony Collapse Disorder. In a vicious cycle, since 1987 when the Varroa mite was first discovered in the US, Monsanto, Dow, Bayer and other large chemical manufacturers aggressively glommed onto the bee industry selling genetically modified insecticides and herbicides as the quick and easy fix to remedy the parasitic invasion, only to weaken the bees’ natural genetic defenses to fight off the parasite. In an article from the Guardian earlier this month, Monsanto’s contribution to the vanishing bee population is detailed. From genetically altered corn, Monsanto produced an insecticide called Bacillus thuringiensis (Bt), which once ingested by bees, Bt binds to receptors within the bee’s stomach lining that keeps the bee from eating. Of course this weakens the bee, causing the breakdown of the inner stomach wall, which in turn makes the bee susceptible to spores and bacteria. To further compound the problem, for years the lobbying power of the chemical giant denied causing damage to the bee’s internal immune capacity for resistance to parasites, which of course only continued to kill off the bee population worldwide. Thus, continued chemical use, especially in America, only exacerbates this growing problem. Also on Greenpeace’s Save the Bees page, a type of insecticide called neonicotinoids, is known to cause acute and chronic poisoning not just of one bee, but the entire colony. Bees take the contaminated nectar and pollen spread through the plant’s DNA back to the hive, creating a highly toxic living environment for all the bees. Toxicity builds up destroying the Central Nervous System, causing further disorientation and bees ultimately can neither fly nor make it back to the nest. Meanwhile, unlike the US, in Europe and Australia where the health of insects and humans is deemed more important than corporate profit, laws banning insecticide use have been passed, which in large part has largely saved the bee populations from being so decimated there. A study last year found 35 pesticides and fungicides, some at lethal doses, in the pollen collected from bees that were used to pollinate food crops in five U.S. states. In another research study, bees that contacted pollen contaminated with fungicides ended up three times more likely to get infected by a parasite closely associated with Colony Collapse Disorder. The results of a new study conducted by Mark Brown of Royal Halloway University in London released several weeks ago found that wild bumblebee populations are also disappearing at a similar rate to the domestic honeybee. In its sample one in five wild bees were afflicted by the Deformed Wing Virus believed to be caused by the parasitic Varroa mite. 88% of the honeybees at the 26 field sites were affected by this virus. The research study also concluded that while honeybees are important and obviously responsible for the multimillion dollar global honey industry, wild bees are believed to be just as important in pollination of plants throughout the world. Another probable factor in America is the widespread use of feeding bee colonies with high fructose corn syrup (HFCS) instead of its natural self-made food honey. For maximum profit, industrialized US bee farms utilize maximum honey yields, not leaving any honey for the bees to consume during the long colder winter months. It is speculated that the natural hormonal and enzyme effects interacting with honey’s natural nutritional advantages provided bees with the increased defenses that historically have been effective in fighting off parasitic threats and viruses. In contrast, the artificially processed HFCS is believe to weaken the immune system of the honeybees’ genetic strength to ward off disease. The largest selling company of honey in the US is the Sioux Honey brand located in Sioux City, Iowa founded in 1921. More than 35 million pounds of honey are processed at the Sioux City and Anaheim, California plants comprised of a cooperative of over 300 beekeepers from the Midwest and Rocky Mountain states. Vice president for research and development Bill Huser interviewed in the local paper last year stated, “One of the wrinkles is a focus on increased diversity in genetics, which the [USDA] report’s authors said could help improve bees’ resistance to disease. Specifically, they said, genetic variation could help keep the bees’ body temperature steady, even if the surrounding environment changes.” This would enhance the bees’ capacity to acclimate to the recent harsher winter conditions in northern climates. Most commercial beekeepers transport their bee colonies by truck in the winter to farms in Texas and California to pollinate in early spring agricultural fields in the warmer regions of the country. However, these last couple winters with far fewer bees, less pollination occurred during the early spring at the Southern California almond orchards. Moreover, because of poor management in agricultural farming over many geographical areas growing only one cash crop, there are far less variety of plants now to pollinate. Bees will not flourish where there exists less opportunity to work their pollen magic because of a lack of diversity in plant vegetation throughout the year. Thus, the almond fields of California need more types of crops planted that will attract bees year-round. That same problem occurs in states like Iowa and Nebraska, once high producers of honey. But in recent decades the agri-industry choice to maximize profit by planting corn and soybean crops instead of the rich alfalfa and clover fields that previously offered a healthy habitat for bee pollination has caused a steady decline in bee population. Additionally, fewer wildflower fields and other natural land space in America in general limit available healthy bee habitats. These corrections to introduce a richer diversity that enhances and expands the bee habitat are both very do-able and obviously urgently needed. Per last month’s report, federal and state partners have been encouraged to consider making prudent changes in land management in order to optimize available nutritional forage for promoting bee health and protecting bee colonies by avoiding use of pesticides. Earlier this month Eugene, Oregon became the first municipality to ban insecticides in the nation. A bill in California would push the state’s Department of Pesticide Regulation to make a decision on its reevaluation of neonicotinoids by July. Maine, New Jersey, and Vermont are also considering plans to ban the use of neonicotinoids. The USDA report strongly recommends increased collaboration and information sharing between crop growers and beekeepers to implement mutually beneficial best known practices. Finally, more research centers designed to learn effective new and innovative methods to facilitate restoration of bee populations throughout the world are sorely needed. Just this month the University of Florida announced the plan to build and develop through research grants a major addition to increase both knowledge and revenue in enhancing the honeybee population. Another viable solution toward increasing the bee population is implementing programs teaching and training urban residents to become amateur beekeepers. Many cities are now offering startup assistance to a growing number of hobbyists of all ages interested in beekeeping. Plus educating urban populations about plant diversity in municipal gardens will enhance both bee habitats and bee health. With increasing interest and awareness in the profound importance of nurturing a much larger bee population globally, the progress dividends for both humanity and the planet will prove immeasurable. http://www.redredsea.net/westpointhagopian/. After the military Joachim earned a masters degree in psychology and eventually became a licensed therapist working in the mental health field for more than a quarter century.